Amid reports that 40,000 kiwis were living on the streets or in emergency shelters thanks to an acute housing crisis in the nation of nearly 5 million, New Zealand's Labour-led government knew it needed to take drastic action to cool the country's white hot housing market - or at least convince the public that it was doing something. So late last year, lawmakers proposed a bill that would limit home purchases to people who carry residential visas. It is called the Overseas Investment Act. 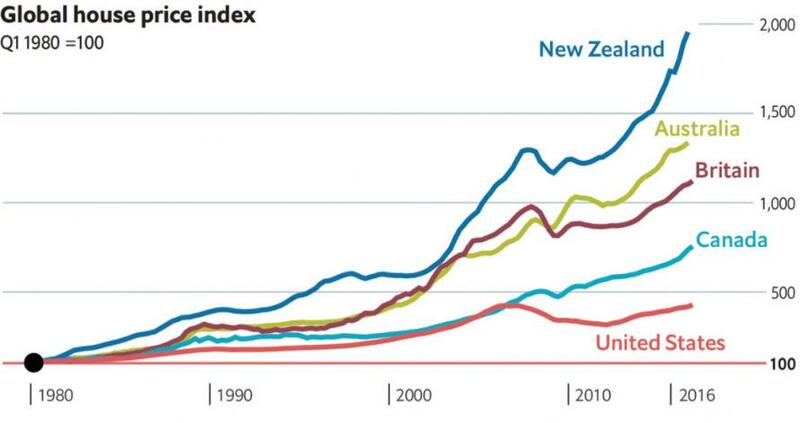 As we've pointed out, home prices in New Zealand have risen dramatically since the financial crisis. Over the past ten years, New Zealand home prices have risen by roughly 60% due to a combination of factors, including limited supply, low interest rates fueling a boom in borrowing, and - of course - foreign speculation. And on Sunday, the chorus of critics against the measure - which hasn't been passed into law - gained another voice: That of the International Monetary Fund. In its annual report on the New Zealand economy, the IMF said the measure would be "unlikely to have a significant impact on housing affordability," and that the rest of the government's "ambitious policy agenda" would likely be more than enough to help make homes more affordable. The government has initiated an ambitious policy agenda to restore housing affordability, which appropriately focuses on strengthening supply and lowering tax distortions . The agenda includes several work streams. The KiwiBuild program aims to increase housing supply at affordable price points. The Urban Growth Agenda aims to address regulatory, planning and other policies that reduce development capacity for growth, along with the under-funding of local infrastructure development and maintenance. The government has already announced the extension of the bright-line test on sale of residential property from within two years of purchase to within five years and also proposes to limit negative gearing from rental properties. A Tax Working Group is considering possible additional reform, including a broader capital gains tax on real estate investment and land tax reform, although its mandate is narrow on the latter. These reforms are complementary, and the success of the housing policy agenda will depend on well-coordinated progress on all fronts. A ban of residential real estate purchases by nonresidents is unlikely to have a significant impact on housing affordability. The proposed ban in the draft amendment to the Overseas Investment Act is a capital flow management measure (CFM) under the IMF’s Institutional View on capital flows. The measure is unlikely to be temporary or targeted, and foreign buyers seem to have played a minor role in New Zealand’s residential real estate markets recently. The broad housing policy agenda above, if fully implemented, would address most of the potential problems associated with foreign buyers on a less discriminatory basis. Should the measure become law, foreigners would be allowed to build new developments, but only as long as they have plans to sell the property as soon as its finished. However, it would include an exception for people who can convince New Zealand's Overseas Investment Office that they intend to live in the country long term (a group that might soon include a handful of US-based billionaires). Australian citizens are also exempt from the rule. Ironically, reports about the rule led to a surge in home sales as foreigners scrambled to buy ahead of the ban. Local critics of the law, including the Real Estate Institute of New Zealand, agree with the IMF that the measure is unnecessary because foreigners just aren't that big of a factor in the country's housing market: The organization estimates that less than 4% of home buyers are foreigners, per the Independent. As we've previously pointed out, it's probable that banning foreign speculators will cool off the country's property market. But the problem that the government is missing is that it risks triggering a real-estate crash. And when housing prices crash, people feel poorer, so they spend less, a pattern that threatens to afflict the broader economy. In its report, the IMF applauded New Zealand's "solid economic expansion in recent years" and noted that "household debt-related vulnerabilities are expected to decrease..."